Einstein knew it and lived it! Welcome to May! It’s Self-Care Month and one of my very favorite techniques for managing day-to-day stress is listening to what I call my “Higher Self.” I’ve heard it called by many other names; for example, Inner Wisdom, Intuition, and Gut Feelings. Keeping one ear on the same frequency as my Higher Self helps me deal with just about everything, but I find it especially helpful when I need to make decisions or need guidance. Tapping into this ever-present resource tends to be different for different people. If I am facing a decision that I feel “on the fence about,” one simple way I can ask my Higher Self is by thinking about my question on a long in-breath and then listening for the answer on a long out-breath after establishing a meditative state of mind. I also recognize my Higher Self as a source of that “gut feeling” I get sometimes when I’m going through a tough situation or even that flash of certainty that I shouldn’t run my errands quite yet (usually that means I either need to be home for some reason unknown to me at the time or could have gotten a ticket or into an accident if I had left when I had intended to). 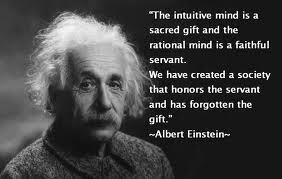 How has your intuition served you in the past? Do you listen and take its advice or are you more likely to ignore a hunch? Today, I challenge you to “listen to you heart” instead of just your mind. Our thoughts can get confusing, but our hearts – the source and residence of our intuition – are usually crystal clear. It’s just a matter of having faith that your intuition is never going to steer you wrong! Try it out (or practice it if you already use this technique) and let us know how it goes! If you’d like to participate in our May Challenge, write a brief description of how you tapped into your intuition and how it worked (or didn’t work) for you. Email your paragraph to me at sglaesmann@mac.com and you’ll be entered in the drawing to win fabulous prizes during the week of May 21 – 25, 2012. May is Self-Care Month-We Need You!